I am generally impressed with the quality of the chess interfaces reviewed here. Xboard and eboard are highly professional clients that are worth checking out. Howver Gnome Chess does need more development to improve its stability. Compiling and installation of these programs was extremely easy. All of these clients support premove, except Gnome Chess. 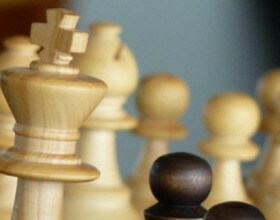 Premove is a slightly controversial feature that is offered at some Internet Chess Servers. This is the ability to preselect your move whilst it is your opponent’s turn to move. In very short time games this is a distinct advantage because it allows you to move without any time being deducted from your clock. It is important that your client supports premove if only for the reason that your opponent does not get an unfair advantage. All of the ratings below are scored out of a maximum of 10. I feel that Xboard is more appealing to the experienced Linux enthusiast because it relies so heavily on command line options. A configuration tool that helped the newbie set up Xboard would be a distinct improvement. In WinBoard (the Windows version of Xboard) the options are set from the interface. In play Xboard is a dream to use, the quality of the pieces and board are superb but the Athena widgets look prehistoric in the days of polished KDE and GNOME interfaces. In many ways eboard rivals Xboard as the best Linux chess interface. Its options are configured by a polished GNOME interface and whilst it lacks many of the features in Xboard it more than compensates for this with its superb text chat facilities and ’seek graph’. Having channels in separate consoles also makes it much easier to follow conversations than in Xboard. The auhor plans to add real bughouse support in a future version as well as legality checking for variants. This interface is highly recommended for people who don’t like editing configuration files. I would strongly recommend the major distributions to include this program in future releases. I find it extremely difficult to recommend this software. It has the smallest number of features, the worst board and is extremely buggy. In time I hope it develops into a stable product that represents a real alternative to Xboard and eboard. It is worth reiterating that ics.el relies on Xboard to provide the graphical board. Using Xemacs and Xboard is an improvement to the text abilities of Xboard on its own. Although Xboard has long supported colorization of the text, ics.el adds improved font support and buttons. If you are already regularly running (X)emacs it makes sense to use ics.el. But for everyone else I recommend you use Xboard or eboard, because Xemacs is one of the most memory hungry programs available for Linux. It would be a huge overkill to just run Xemacs solely as a text interface to an Internet Chess Server.